We all know that money doesn’t grow on trees, and for most of us, we try (and fail) to save money in many different ways. From making coffee at home to driving less, we know that small cutbacks can help us save more money in the long run. There are many different ways to save some extra cash. One way that you may not consider often is your water bill. Reducing your water bill may seem like a challenge, but there are many ways in which you can reduce your water bill and save money over time. At Cupertino Plumbing, we can help fix any plumbing problems you may have, which is a great place to start saving money! In this blog, we are going to discuss some of the best ways to cut back on your water bill. Read on to learn more and start saving. If you keep bottles of pitchers of water in the fridge, you will always have access to cold and refreshing water. This means you will no longer have to leave the water running, waiting for it to get cold enough to enjoy. Keep water bottles or pitchers full of water in your fridge so that you can get access to cold water when you need it. Or just add ice to your water! While it may take some time to make ice, it will help reduce the time you leave your water on waiting for cold water. Showers are an escape for some people. This is the time and place where they can prepare for the day ahead or simply clear their head. While we don’t want to tell you that you can’t enjoy your shower time anymore, if you are serious about reducing your water bill, you can start by taking shorter showers or showering less. An article from U.S. News mentions that cutting your shower down by four minutes, you can save almost 4,000 gallons of water a year. That is sure to save you a few bucks! If you have any faucets that drip constantly, you will want to have those fixed immediately. While a single and slow drip may seem harmless, those drops add up. You are wasting a ton of water by letting the drip continue day after day. To figure out how much water you are wasting, use this drip calculator! Maybe calculating it for yourself will help you decide to get that leaky faucet fixed! Our team can help fix any leak you may have. Lazy people can rejoice knowing that using the dishwasher can actually save water and money! Make sure you are running a full load and let the work be done for you! Not only can you sit back and relax, but you can also save money. Just make sure everything you buy from here on out is dishwasher safe! By upgrading to Energy Star appliances, you will be able to cut back on your water use as well as energy! This is a win-win and will save you money on both your electricity bill and your water bill. Aerators can help to reduce the amount of water that your faucet uses and makes the flow more forceful. Aerators make the water pressure better while reducing the amount of water being used, which is a great way to use less water and save money. Adding an aerator to all of the faucets in your home can help add to the water saving plan! A new, low-flow toilet can help you drastically reduce the amount of water you are using. Each flush of the toilet uses a ton of water, which is not necessary. When you switch to low-flow toilets, you will be able to save water and money. 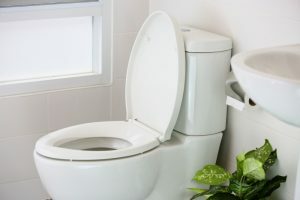 If you don’t have the money to switch to low-flow toilets, or you simply don’t want to take on this type of project right now, you can convert your current toilet to one that uses less water. How? Simply add weight to the toilet tank! You can fill plastic water bottles with an inch or two of sand or gravel and place them in your toilet tank. This will raise the water and make your toilet use less water per flush! Give this clever trick a try and see how it reduces your water bill. While this may not be appealing, it could really help with your water bill. There is a saying that goes “If it’s brown, flush it down. If it’s yellow, let it mellow.” We know, it’s not the most enticing way to save money on your water bill, but if you live alone or have your own bathroom, who will even know? This may be very obvious, but using less water is a great place to start reducing your water bill. Simply being more conscious of how much water you are using and how much you are wasting is a great way to get started with cutting back. Do you leave the sink on while you brush your teeth? Do you let the shower run for 10 minutes before you even get in? 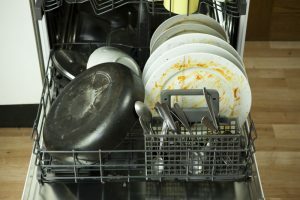 Do you leave the sink on while you are washing dishes? Do you clean your car at home with the garden house weekly? Do you take multiple showers a day? These are the types of things you need to ask yourself. These are simple places to start cutting back on water and changing your habits. Being more conscious of your water usage can help you start saving! 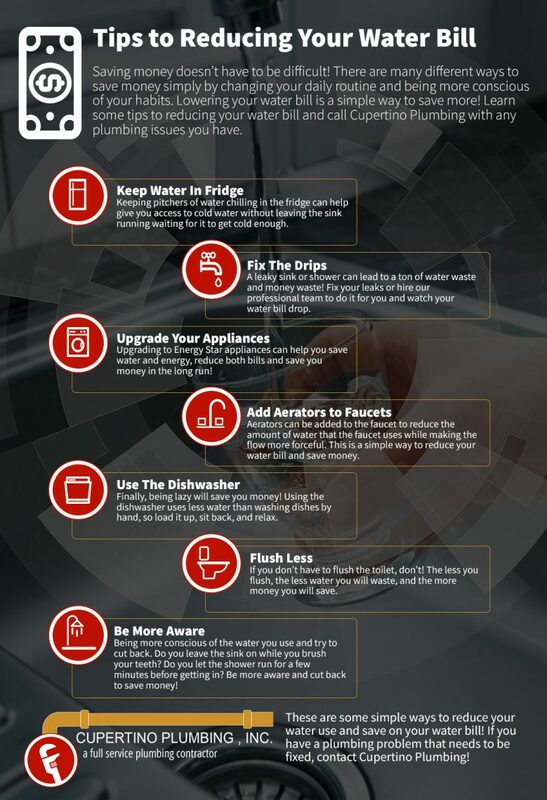 Hopefully, these tips help you learn easy and quick ways to reduce your water use and save money on your bill! Get plumbing help from Cupertino Plumbing. We provide services in the San Jose area! Contact us today.